Think about it. 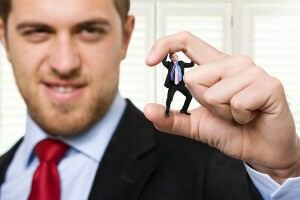 How many times have you seen a person running an organization, large or small, who seems ill suited for the role? Perhaps it was “daddy’s company.” Or, maybe this person knew how to play politics and undermine others on the way to the top, even though the organization didn’t benefit whatsoever. In politics, the kingmakers often decide who will be running for a congressional district, and who gets political appointments. It’s not right or just; that’s just the way it is. So what are you doing about it? Do you complain? Do you bury or divert your displeasure? I mean, what can you do about it anyway? You’re just a cog in the system and it’s beyond your control. You’re paid a salary and you earn it every day, in part by putting up with the jerk above you. Right? For those of you that are victims let me propose a second corollary to the Peter Principle: If someone above you is unqualified for the role and you continue to do nothing about it, then you deserve exactly what you get and will remain at your level as well. Sound harsh? If it does, chances are I struck a nerve. Good! Live is meant for living, and your energy should be spent pursuing your goals, collaborating on true teams, and creating beauty. Live your life in crescendo, not under some glass ceiling.